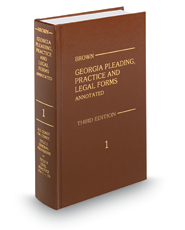 Brown's Georgia Pleading, Practice and Legal Forms Annotated provides a complete library of forms applicable to most kinds of cases or transactions. For quick selection, the forms are arranged according to provisions of the Georgia Code. Georgia attorneys with extensive experience authored the forms, which cover areas such as civil practice and procedure, extraordinary writs, appeals, probate and the administration of estates, guardianship, criminal procedure, and general legal and business forms. Statutory amendments are incorporated each year and the forms are revised accordingly.